Cleaning the carpets is a particular chore that is not very fun to do yet necessary, and, contrary to the common belief, actually needs to be done regularly. Unfortunately, many carpet owners clean their carpets only once every few years. Some even don’t clean at all. If you are also a carpet owner, you need to know that carpet cleaning is not just a matter of removing stains. Cleaning your carpets can and will improve the carpets’ performance and lifetime. Nevertheless, when the time to clean the carpets has come, you usually get confused whether you should hire a carpet cleaning professional or do it yourself. There are indeed pros and cons of both options. Below, we are going to discuss how often that you should clean your carpet and whether hiring a carpet cleaning professional or doing yourself is better. First of all, carpets are expensive! If you don’t clean your carpets regularly, they will not last very long. Cleaning your carpets regularly can help to keep them in good condition so that they can last longer. The cost of cleaning the carpets is certainly lower than replacing the entire area frequently. Secondly, regularly cleaning your carpets can reduce and prevent the spread of allergens and bacteria, thus improving the overall quality of your living space. If you are not aware of it yet, carpets make a perfect breeding ground for allergens and bacteria. The folds and pores can collect and build up allergens and bacteria. If there are children, pets, or people with allergies in the home, regular carpet cleaning is imperative. Finally, the obvious reason to clean your carpet regularly is to maintain the look and improve the smell. A home won’t look clean if the carpets are not actually clean. A clean-looking home won’t really feel clean if there is a strange smell circulating in the air. Many manufacturers recommend that you clean your carpets at least once every 12 – 18 months. If the foot traffic in your home is high, more frequent cleaning is probably needed. 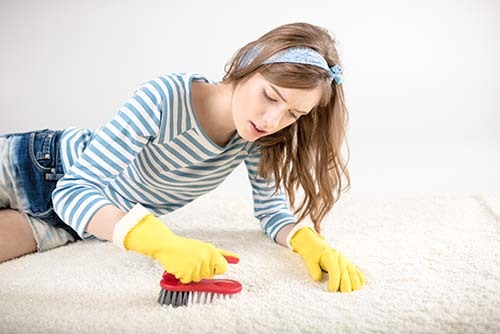 Such frequent cleaning is usually also a required condition for the warranty of the carpet, so make sure that you read carefully the warranty information. Although vacuuming your carpets is an excellent way to remove most dirt and debris, you still need to deep clean your carpets to really remove build-ups and tougher stains. The carpet cleaning method that most manufacturers and professionals recommend is hot water extraction alias steam cleaning. 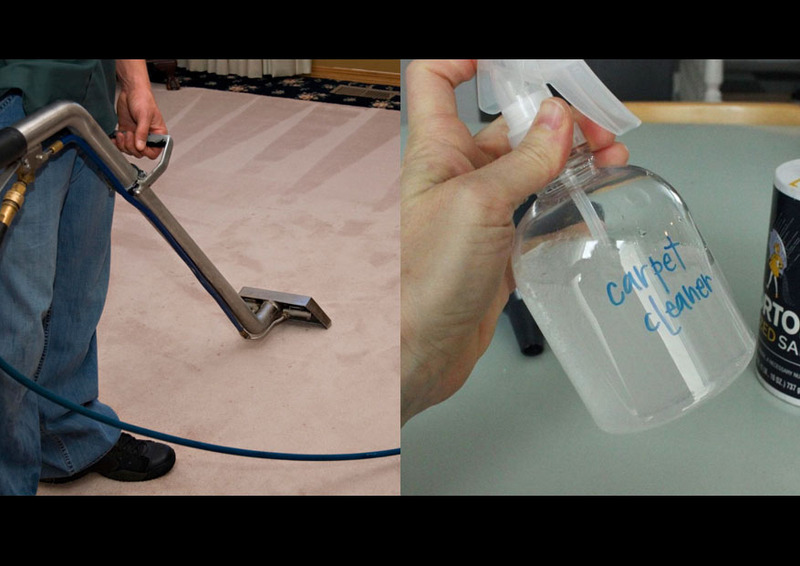 The method basically sprays some hot water that has been mixed with a cleaning solution onto the carpet. A cleaning solution is added in order to make the hot water more effective in removing stubborn stains and soiling. Afterward, the hot water is sucked back into the machine along with any dirt, debris, and grime that was in the carpet. Such method is now often called steam cleaning, though the term is not fully correct because we use hot water rather than steam. Still, steam cleaning usually refers to hot water extraction when it comes to carpet cleaning. A carpet cleaning professional may use a portable machine or a truck-mounted unit. The portable machine is convenient and practical to use in an apartment or condo building. However, the truck-mounted unit should be your primary choice whenever possible because it is more powerful. 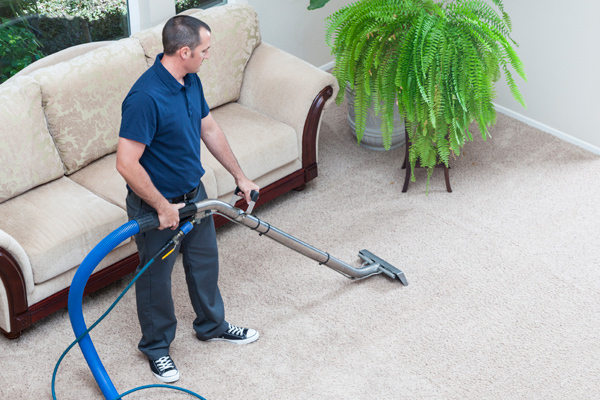 Hiring a carpet cleaning professional, although quite expensive, has several advantages. First, a professional knows exactly what they are doing, so they are less likely to make mistakes. They probably won’t use too much detergent or neglect to rinse away all spots of residue. Second, they use more powerful machines that can maintain the temperature of the hot water properly for the best results. Third, they usually leave the carpets drier, allowing the room to get ready faster. There are many do-it-yourself carpet cleaning machines available on the market, either for rent or for purchase. You can rent a machine to deep clean your carpets, but don’t forget that you still need to buy the detergent. Purchasing a compact carpet cleaning machine is generally recommended for cleaning accidental spills quickly. Cleaning the carpets by yourself is only recommended if you really know what you are doing. You need to know how much detergent to use and the techniques needed to remove the entire residue, such as how fast to move across a particular carpet. Using too much or too few detergent may cause unsatisfying results. Meanwhile, leaving the carpets too damp may damage the carpets and the furniture you place on top of them. Only place the furniture back once the carpets are completely dry. In addition, such DIY carpet cleaning machines are generally not as powerful and reliable as those professional machines. They don’t heat water to the same high temperature, and thus give less effective cleaning. Still, doing it yourself is actually much more budget-friendly. A professional service can give a “great” result whereas doing yourself gives a “good” result, but the cost of hiring a professional service is considerably more expensive than doing yourself. While you can vacuum your carpets by yourself on a daily basis to reduce dirt and dust build-ups, getting a carpet cleaning professional service to deep-clean the carpets every 12 – 18 months is recommended. They give the best results and are much less likely to make mistakes. DIY machines are not as effective, but you can do it yourself if you know precisely what you are doing and don’t mind performing extra efforts in order to save some bucks. Be careful not to use too much/few detergent, and make sure that you don’t leave any residue.